WIRED partnered with Infiniti Q50 to deliver Signals 101—an all new series, led by Senior Writer Mat Honan, that steered the WIRED community in the right direction about the most crucial “signals” to follow across all media platforms. 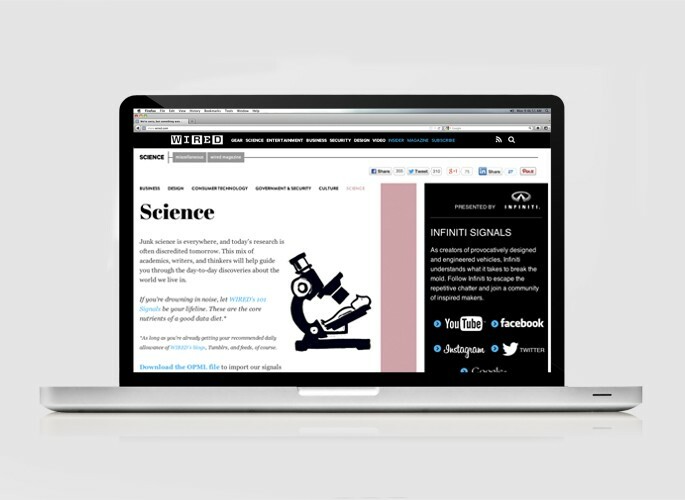 Digital: Signals 101 on WIRED.com was launched in conjunction with the launch of the Infiniti’s Q50 online flight. Infiniti incorporated five Infiniti specific “signals” or links to their social media platforms. A custom billboard unit with supplied Infiniti assets was built in conjunction with the program. Infiniti had complete ownership of Signals 101—both the landing page and Honan’s feature article.